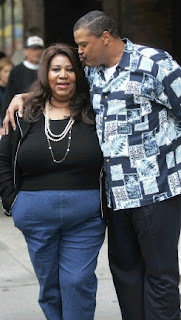 Soul great Aretha Franklin is on a crash diet in a bid to lose weight before her wedding next month. The singer has signed up with Jenny Craig Diet and is limiting herself to 1,750 calories-a-day in an effort to slim down. Aretha Franklin says, "I'm at 1,750 calories a day and I'm starving. You just have to get used to portions and changing your lifestyle." She tells Sister 2 Sister magazine, "I lost 23 or 24 pounds to begin with, but it's kind of a strain when you get to 23 or 24 pounds. That's why I got off of it. "It's a strain because you're eating the Jenny Craig-type meals, which are very good. But you can only eat them for so long before you want some barbecue ribs or some pigs feet. Once you get off that Jenny Craig thing and you start eating what you've been eating, it's all over."